The Awards in Motion Mirrored Diamond is made of two pieces of crystal fused together with a reflective mirror that, together, spin in a complete circle! The fusion of the mirror and crystal allow light to dance off the award while the crystal diamond reveals a touching message of appreciation. The stunning black base can also be used to communicate a sincere message of praise and appreciation. Designed by skilled artisans, this exclusive award combines geometric shapes with deep bevels. With unprecedented elegance, this impressive award will reward the outstanding achievement of the recipient. The blue crystal of the Azure Diamond takes on new dimension with fascinating and brilliant cuts, topped with a shimmering blue diamond! Lithuanian cast art glass award base and mouth blown glass curve in blues and green set off this major piece that is one of the best in the collection. The Azure Moon is a contemporary award that features a unique combination of optical clear crystal together with blue crystal. The half-circle design and blue accents will highlight any inscription. 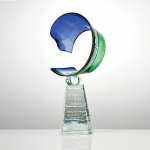 Stunning colored Art Glass award accented with fluid rings of sapphire and a polished aluminum and black marble base. A flawless crystal star emerges out of a beautiful blue crystal base in the Azure Star award. The brilliant blue on the half-cut diamond of the Azurite Award will make any personalized message pop! The stunning facets in the optical crystal base and blue crystal top create highlights when light shines on this award. Pure K9 premium optic crystal star award. Can be used for paper weight or as a standing award. 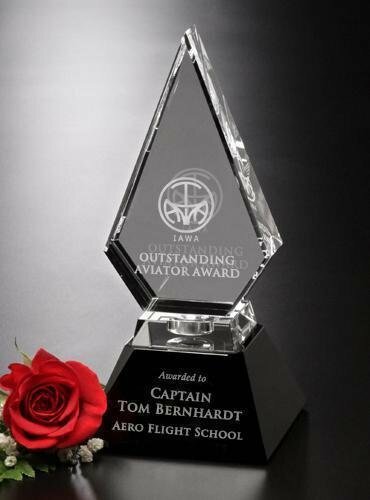 The Back Beveled Black Painted Plaque Acrylic Awards can be laser engraved through the black painted back for a stunning effect! Included is your choice of black base or wall hanger. Available in five sizes! Custom Sizes available.